Nancy Smith is rebutting the Palmdale School District’s rebuttal of a “Budget Analysis Presentation” she made before union members on Oct. 23. [Below] please find my rebuttal statements to the October 24, 2013 press release by the Palmdale School District regarding the PETA and CSEA “Budget Analysis Presentation” on October 23, 2013. As the main presenter at the meeting I want to be perfectly clear that the Palmdale School District Press Release totally misrepresented what was said during that meeting. I have answered each of their accusations that was directed at my analysis. I have provided documents that are downloadable to the entire community and noted that all of those documents are Palmdale School District Board Approved documents that they filed officially with the Los Angeles County Office of Education, the State of California and the community of Palmdale School District. On October 23rd PETA and CSEA presented their narrow version of an analysis of the Palmdale School District budget. The only thing that was narrow about the budget analysis was that I dealt with only the general fund and the misrepresentations made by the district about the financial shape of Palmdale School District. 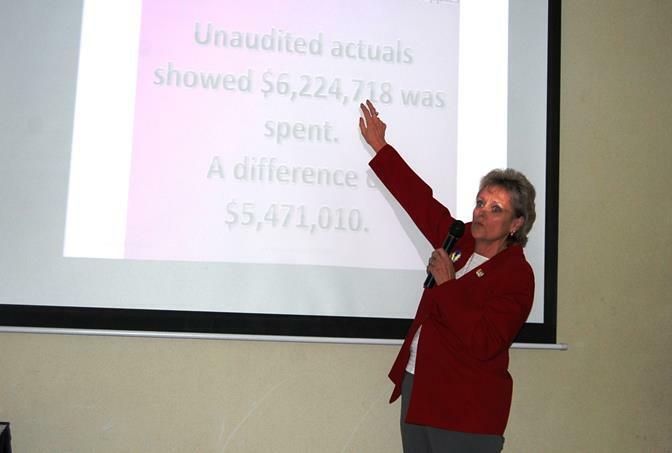 Mrs. Smith presented a slide show in which she accused the District of being too conservative in budget development. She stated her information was taken directly from Board approved financial reports; however the “facts” she presented were artificially contrived since they were presented without context and with no designation between restricted versus unrestricted monies. I never accused the District of “being too conservative”, I said that they had misrepresented the financial condition of the Palmdale School District and told the public, employees, Los Angeles County Office of Education and the fact finders they were broke, when they are not. There were NO ARTIFICIALLY CONTRIVED FACTS, THE NUMBERS CAME STRAIGHT FROM BOARD ADOPTED AND APPROVED REPORTS. Their financial reports adopted in March and June were so inaccurate that they most definitely constitute lying to all of the constituents. I also differentiated many times the difference between unrestricted and restricted funds during the presentation. The context was well documented with all backup for the analysis posted to the website at the time the presentation started at 5:30 pm that evening. I did not accuse the District of an “appearance of over-estimating budget amount”, I used factual information that they actually did over-estimate budget amounts. The ADMINISTRATORS that did the adjustment during the year obviously did not do an accurate job in making those adjustments. The $125 million was already taken into account when the District presented its financial numbers and had nothing to do with the actual ending balances for the current year. Those balances are based on what was actually received in revenue and what the District actually spent during this school year. She failed to mention the generous contingency language the District included in the current labor agreements that automatically restores salary reductions and furlough days should the Unrestricted Ending Fund Balance increase and/or new unrestricted revenue be received. She failed to mention that Palmdale School District is one of the few districts in the State that has managed finances so well during the past 6 years that salary reduction or furlough days were not imposed. She failed to mention that the reductions imposed for 2013-14 have been fully restored and that we have already restored 11.2% of the 12.2% salary reduction intended for 2014-15. The fact that “ the generous contingency language the District included in current labor agreements” means very little when you consider that there was no need to impose on the teachers or threaten the classified staff with over 400 layoff pink slips if they didn’t agree to take the salary and benefits cuts. It should also be noted that the teachers and classified had lowered their health benefits plans, teachers accepted larger class sizes and that many classified positions were laid off or had their work hours severely reduced. The reductions imposed for 2013-14 have not been fully restored; an email went out to employees saying that the salary portion of reduction would be restored if several events come together by the first interim report later in the year. There was no restoration of the imposed 9 furlough days for 2013-14 in that email unless additional monies become available. THIS IS NOT FULL RESTORATION! Also the health benefit cuts imposed on the teachers has not been restored and there is no mention of that in the email. The District provided inaccurate numbers and the fact finder still recommended a health benefits cap of $16750 with a 50/50 split of increases above that amount. The Board of Trustees chose to implement harsher caps than recommended by the fact finder even though they knew they had adequate money to meet their obligations. How much taxpayer money did it cost the Palmdale School District in legal fees to make this imposition? Palmdale School District staff has worked diligently to protect the classroom by taking full advantage of the flexibility options offered by the State and ARRA monies provided by the Federal government. We have intentionally developed a healthy Ending Fund Balance to use specifically to maintain our labor base with as little disruption as possible. The Board of Trustees have made difficult decisions to ensure fiscal solvency for the Palmdale School District that has resulted in increased test scores and new programs for students. It is unfortunate that Mrs. Smith has chosen to assault the good things that have taken place at the Palmdale School District. I have no problem with the Board of Trustees “developing a healthy Ending Fund Balance”. Just be open and honest about it and don’t tell the community you are broke and can’t meet your obligations when you can. The Board and administration declared in two different documents sent to Los Angeles County Office of Education, State of California and the fact finders that they could NOT meet their obligations. These unnecessary cuts have been very disruptive to the labor force, students and parents, so if the intention was to not be disruptive the board failed miserably. I never attacked any of the programs the district has been providing for students. Again this is smoke and mirrors and an outright lie about what I said during the presentation with factual documentation. 31 comments for "Candidate responds to Palmdale School District response"
Time for Round 2. Gallizzi, Corrales, Stanford, Ferrin, and Bynum have officially robbed the Palmdale School District! Happy Friday Taxpayers! Please present evidence to support such an outrageous allegation of criminality. How bout you go to the PSD website and read it for yourself….if you haven’t already? What is unbelievable is that tomorrow morning the Palmdale School District Board will be buying out the Superintendent. Everything is posted on the PSD website under current meeting. The settlement is there for everyone to see. The Superintendent will be bought out for $350,000 + health benefits to age 75 + life insurance and long term Care insurance. The kicker folks is that they are hold the Superintendent “harmless” now and in the future. Oh wait clause 9 puts gag order on the newly elected board who do not take their seats officially until Dec. 10. The “Special Board Meeting” is scheduled for tomorrow morning at 9:00 a.m. Parents, teachers and other staff are working at that hour so how can they give their input on this? This Board had just had a Board Meeting on Tuesday night. Why was it not said to the public? They did not report out at that meeting on anything about a buy out. There was a presentation about the PSD budget where it was found that students were deprived of over $5.5 million for students materials & supplies. How can there be a buyout when there needs to be an investigation done and Board and Administration need to be held accountable, not buy them out. This item should not be approved until it has been investigated by the Newly elected Board. Clauses 9 & 11 are ridiculous. 11 is we’re they cannot divulge the attorney fees incurred? Is this not taxpayer money and public info. Where is the agenda that shows clear and unambiguous information to the public so that they were clear about what this Board was doing in Closed Session? Didn’t Jeff Ferrin state at the debate that this Board had not done any settlements and it was proven during the budget presentation by Mrs. Smith & the teachers union that 18 settlements had been done under Corrales & Ferrin…now this settlement worth we’ll over $500,000. Talk about leaving a legacy. Buying out the Superintendent is wrong. Really Charles?! That’s how PSD rolls! That does not make it right, ethical or legal? If people in the City of Bell just sat backed and watched nothing would have been done. What amazes me, after reading the buy-out documents, is that this board and soon to be ex-superintendent believe that if laws were broken, they can all hide behind this negotiated agreement. Mrs. Smith has already proven that the documents that were filed with the Los Angeles County Office of Education were false. I am not an attorney, but as I understand it, knowingly signing and submitting false financial documents is a crime. What other larger issues are they hoping to cover up by agreeing to this buy-out and gag order? Indeed, the “winner” of the prestigious Superintendent’s Award doesn’t want anyone to know what his “accomplishments” here were. Read the agreement. If asked for a reference, all the HR department can give his name, rank and serial number. It is my opinion that the board does not have the authority to protect Mr. Gallizzi from embarrassment for bad judgment or prosecution for a crime. They might want to re-think their position tomorrow morning before the vote. It would appear that our work here is not done. There is a teacher working for PSD that had a Warrant for Arrest an the person is a convicted criminal and coming to work with a Electronic Monitoring on the leg. Corrupt, this is a outrage that they need teacher so bad that they dont even check out the background. So this is what it comes to employed criminal now working around innocent children. I find it interesting that in all the articles, mailers, etc, I have read regarding the elections in Palmdale, when the incumbents feel threatened or called out on something the immediate response is “Blame it on Parris”. I don’t think the majority of Palmdale residents are buying into that. Maybe Rex should run for mayor of Palmdale, now that would be funny! Plain and simple, Palmdale needs new blood running the show. Maybe the people of Palmdale are sick of Rex sticking his nose in where it doesn’t belong. He should worry about his own city and quit suing, mocking and lying about the ones next to him. Parris has made it publicly clear that he intends to put his people into as many seats in as many boards as he can. This is well published fact – even in the AV Parris newspaper. I even got a mailer from him endorsing candidates in the various races – including Palmdale! FINALLY! Someone else who is as disgusted and upset as I am regarding issues that YOU WOULD THINK MOST PEOPLE would be absolutely horrified and outraged to learn what is actually going on TO OUR CHILDREN IN OUR SCHOOLS ( and other places as well) BY PEOPLE WHO ARE SUPPOSE TO BE not only educating our children, but NUTURING AND PROTECTING THEM AS WELL. But as usual, I see that NOONE has posted ANY comments or inquiries as to the validity of something so utterly disturbing as this. For all of you who are unwilling to believe this information ( or it seems even unconcerned ) let me assure you IT IS ABSOLUTELY TRUE. And it goes much deeper than this one incident I assure you. Filth such as this has been systematically controing and infecting your children for a very long time now. I was a student at the universities here for about five years and have been ( yes past tense ) teaching for several districts ( k-12 ) and have taught at just about every elementary, middle and several high schools in this area for almost ten years. The crimes perpetuated on our children ( yes THEY ARE CRIMES ) have absolutely sickened me. I have been fired fired from several districts and been denied hard earned teaching credentials from universities because I WROTE ABOUT AND SPOKE OUT ABOUT these deplorable acts that are being used to manipulate and control the minds of our children ( doing an even better job on most adults as well) . Yes, our children are being used by these filth in order to fulfill their own sick wants and desires. During my time at the university ( Bakersfield) I was given papers to sign in certain classes that stated they could use my information gathered from my student and in my papers ( required to pass a course ) on children as ” human research” subjects!!! And believe me, that is EXACTLY WHAT THEY HAVE BEEN DOING. They hold assemblies that talk about and show explicit sexual act and information to children as young as KINDERGARDENERS . These “youth rallies” are the conduit of choice for the older children ( who are perfect for manipulation because of their changing emotional and physical development ) . Please refer to my posting; some are under education and some under ” you issues”. Youth rallies headed by Michelle Bowers ( who is superintendent at lancaster SD and who is considered to be ” the architect” for this planned mind control) also PLEASE find the posting about the violet ” PRIDE” bisexual, transexual , gay etc. graduation. Read what they are COERCING OUR CHILDREN INTO BELIEVING Any of those people look familiar? Hey it’s secretary of finance and hey is that roger gallizzi? Also articles about student who is president of the youth council…. Please find and read my posting as there is ALOT of info I put on there about AB 1066. Also one where some of our city representatives are asking it not be allowed … Try to find that particular one. Sorry trying to hurry before this shuts down as it has happened when I’m writing and try to post many times . Please believe that these new hospitals are also being built for research not only on your kids but on YOU as well. Cancer research….organ donors , mental health, social services, counseling ALL A PART OF IT. I have ALOT of these surveys that children were given and believe me people its being used as a way to get to you adults ( parents ) as well. To discredit you, jail you, take away your children , split up families so they can raise children to think like, act like and be like them. Courses on how to cause problems in your family to get to do what you want oh and they are rewarded. Building a workforce to their liking . Train them to spy on family, friends etc etc. But the medical is very scary can make and keep your children and you sick. LOTS OF $$$ involved. Believe me if Nancy smith was secretary / principle she knew exactly what was going on and how the funds were being used for these ” projects ” just the one story you told proves that and what I am saying is ALL COMPLETELY TRUE AND FACTUAL. I WELCOME AND WILL BE PRESENT FOR ANY INVESTIGATION OR INQUIRY BY ANYONE WHO WISHES TO DENY THESE ACUSATIONS ( no theses FACTS) that I have presented as true. PLEASE IF ANY OF YOU ADULTS OUT THERE HAVE HAD YOUR DOUBTS OR FEELING THAT SOMETHING IS WRONG BUT YOU CAN’T QUITE FIGURE IT OUT THINK ABOUT SOME OF THE THINGS I HAVE SAID….. Honestly. And there is much much more in the works if we don’t do something to stop it and hold those accountable for their CRIMES! Oh honey, please get help. This is not a caustic, snarky reply. You are obviously disturbed and in need of care or medication. I have just received some polling numbers and the union is in big trouble in this stage of the election, Hugo is like a lightning rod. Doc, you and Jeff Ferrin are sure fixed on me. No, I’m not a candidate. You and the incumbents and the Palmdale First mob sure know how to pass on blame; LACOE, Rex, and Hugo. Cry, cry, cry. Accept responsibility. Look at the Political observer today. Incumbents didn’t return calls for comment. At least I have the guts to return calls and face the music. You obviously believe the b.s. that the ONE incumbent has been feeding you. The other two are just riding her coat tails. Sandy cares only about herself amd her husband. We are neck deep in doodoo here. I for one refuse to allow these 3 from ruining us further. Why not give new people an opportunity to right the wrong? !!! If you aren’t well informed or are not or have not suffered under their leadership, you should do more research before making accusations and before stating that these people are the right fit for the district. They’ve only been the right fit for Gallizzi and his every desire. But where is Gallizzi now? Oh right…”sick.” Sounds to me like he’s waiting to see who wins and must have a resignation letter ready if his rubber stampers don’t win. Because he knows he will be outted for all the corruption he’s responsible for. Not a follower clearly did not follow my actual posting before adding his blithering. Sorry – I’m not buying into the hype. Amen to that. Hopefully Gallizzi be ousted & hold civil and criminally accountable for his cooking of the books now that we have a NEW PSD board members. He will be the first one to point the fingers at Corrales, Stanford, Ferrin and Bynam, Gallizzi’s puppets. Doc, this appears to be a last minute attempt at mud slinging before the election. As a voter, I would appreciate if you can tell us here when and where you will post your documented proof so we can see it prior to going to the polls on Tuesday. It appears as though the only individual who is providing any type if concrete proof is Mrs. Smith. She has provided the entire community with solid proof that we have been able to download. It must anger the incumbents that her proof are the District’s own Board approved documents which were submitted to the Los Angeles County Office of Education and other agencies. I look forward to you notifying all of us when and where you will post your proof, so we the public can review and make an informed decision as to who we will vote for. I tend to rely on facts and legitimate documentation, therefore she has my vote. I’m convinced that Nancy Smith is by far the best candidate for the PSD board. She’s put in WAY more work analyzing the budget than the incumbents ever would (or could). They are a bunch of no-nothing rubber stampers who offer no expertise or oversight. Employees, parents and students are ashamed of PSD. Change is long overdue!!! I’ve come to the conclusion that the incubents NEVER analyzed the books. They are all frigin clueless when it comes to the finances of PSD…no othet explanation. How bout Gallizzi? Oh wait he’s out on a medical leave while his loyal employees try to clean up the mess. A school district is s business, a business thst is owned by the student’s, and paid for by the taxpayers. I can only hope that the people of the PSD community are ready to take back what belongs to them. The kids deserve 100% honesty & commitment from those who work for them! Mrs. Smith is the best candidate Lancaster money can buy, Vote no on Smith and give Rex the message that we do not not need his people in Palmdale. Doc Rivers. I will aware on a stack of Bibles that I have not received one thin dime or any money from Rex Parris or Lancaster. You should check out the facts and not just believe what Ledford or Corralled spoon feeds you. I am my own person and no body’s rubber stamp. Mrs. Smith, can you please explain why there was never an investigation into who placed hidden cameras in Teachers rooms, while you were superintendent of the PSD? Thanks in advance. Mrs. Smith swears she does not take Lancaster money well it never is Rex because he just tells the others what to do. You need to get your story straight. Right on, Doc! I can not believe how many slick, expensive flyers I have gotten in my mailbox from LANCASTER trying to oust the incumbents in this race. I smell Parris behind these candidates. He has made it crystal clear that he intends to take over every potential position of power in Palmdale and this kind of BS mudslinging is exactly his style. Until we can ferret out the honest candidates from the Parris-bought ones, I’m sticking with those elected officials that have shown resistance to Parris’ attempts. I can assure you that these candidates are not being influenced by Rex or his cronies. I’m retired after 17 years with the PSD, and I know these candidates PETA supported. The current school board and superintendent are totally corrupt! I’ve seen the inner workings. Take a valium, Ledford’s cronies Corrales, Standford and Ferrin are history.